See the X in the stem end? That's one trick to cooking Brussels sprouts evenly, inside as well as out. The other is to select sprouts which are similar in size. I happen to like the teeny-tiny bite-size ones. The lemon/Parmesan treatment was "okay" but forgettable. Place 1 - 2 inches of water in a large pot with a steamer basket and bring to a boil. Sprinkle with the lemon juice and Parmesan. Season with salt and pepper and serve. Lisa - I love Brussels too and agree, yes, they're so perfect for fall (and at least according to my mother and her English heritage, Christmas dinner). 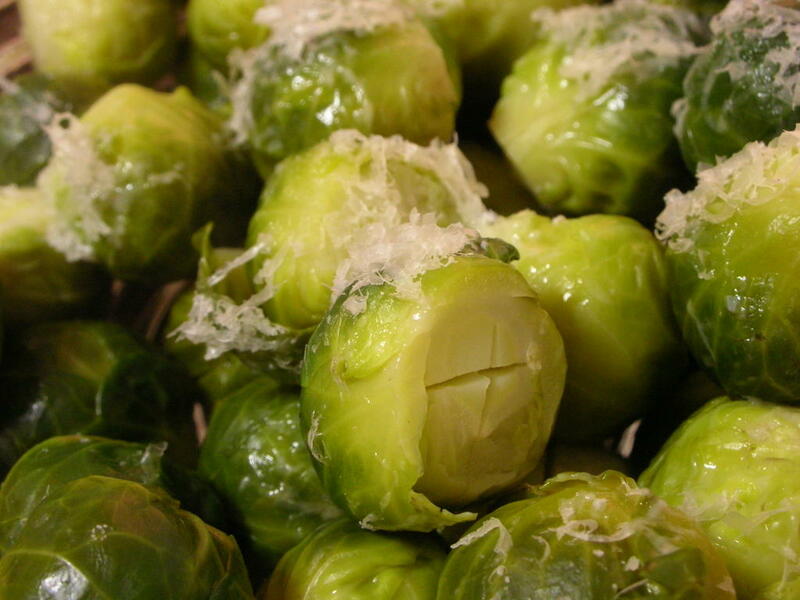 I've got braised Brussels bookmarked somewhere, sounds similar to what you're suggesting. This version lemon/parmesan thing was actually a "save" because the intended brown sugar/butter/pecan glaze scorched when I left the pot unattended too long. Both will hit the site some time soon, I suspect. Thanks for stopping in -- yours is a new site for me, I've RSSd it and will pay attention now!